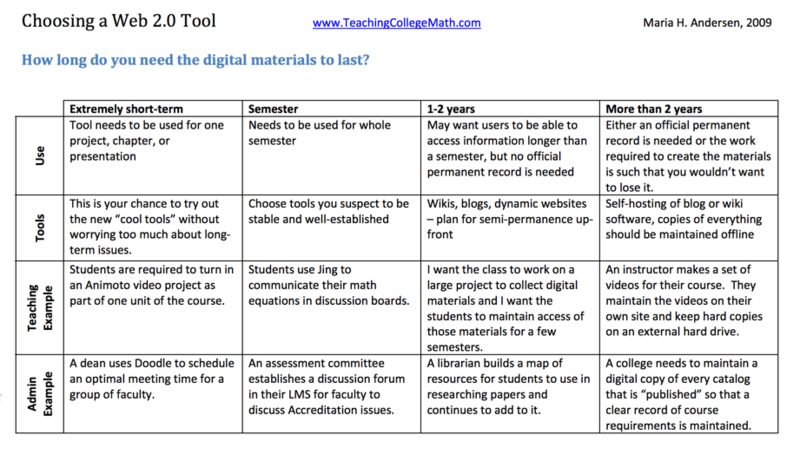 I was asked to give a presentation at Northwestern Michigan College last week to help faculty and staff decide which Web 2.0 tool to use for their projects or courses. It’s more common to do a “gee-wiz” presentation on what Web 2.0 tools are out there and how they could be used, so this was a little unusual. As such, I had to sit down and think about how I decide what tools to choose, and then do a little research about what other eLearning professionals consider when deciding what to use. The result of this thinking and researching was a Choosing a Web 2.0 Tool handout to use for the presentation to help participants either choose between general tools (like wiki, blog, or website) or more specific choices like (Animoto, Prezi, Slideshare). Please feel free to use this handout if it is helpful to you (you can always find it under Resources -> Handouts on this site.